When a loud noise forced foreman William Mack Brazel to hop in his pickup truck and inspect Foster Ranch, he found such strange debris in a corn field that he assumed it was the wreckage of a UFO and the victims, aliens. That was July 2, 1947. 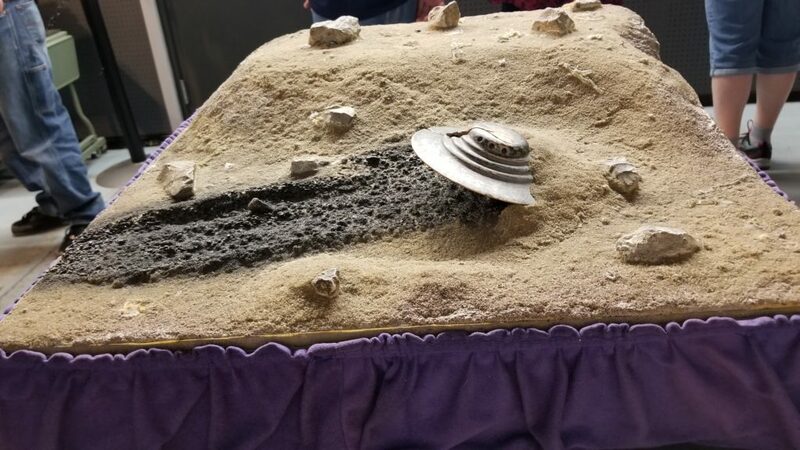 The model of the 1947 crash site built from witness accounts is a highlight of the International UFO Museum. About 75 miles away, the closest New Mexico town — Roswell — quickly became known as the “flying saucer crash site.” Roswell has long played on that heritage with charm and skill, giving off its strongest extraterrestrial vibe during the annual UFO Festival celebrated each July 4th weekend. After 71 years, it has blossomed into a commercial extravaganza (38,000 people attended in 2017) for dealers of alienabilia as well as scientists studying extraterrestrial life. Where the two meet is what makes a visit to Roswell so interesting. The next day, Mack Brazel gathered some of the remains and took them into the Roswell Sheriff’s office. Due to the proximity of the Roswell Army Air Field (RAAF), the Sheriff called in the Army Counter-Intelligence Corps to investigate and the rest, many believe, is coverup. On July 8, 1947, the RAAF’s PR office issued a press release to AP Wire about the recovery of a crashed flying saucer. “RAAF Captures Flying Saucer on Ranch in Roswell Region” made front pages around the country. Neighbors talked about seeing a UFO in flames and heard that child-size coffins had been ordered from the funeral home. By the next day, after witnesses had been interviewed by government officials, public accounts of the incident went about face: New news headlines called it a weather balloon. In 1994 – nearly a half century later — the Air Force admitted that the weather balloon carried test dummies and was, in truth, part of the secret spy mission Project Mogul. The case was officially closed. Really? 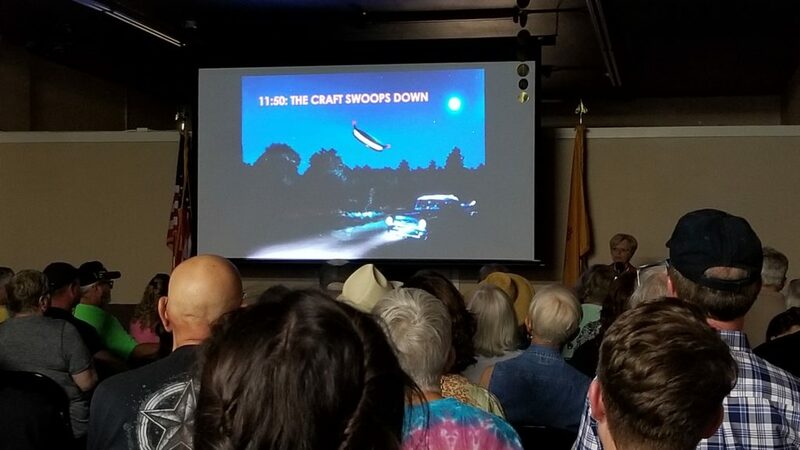 The audience at the Internationl UFO Museum is captivated by a presentation on the Betty and Barney Hill Abduction from 1961. Flying saucers. Little green men. Serious study of reported encounters with life from other planets has long been relegated to Buck Rogers style fantasy. The final word – the official Air Force Roswell Report: Case Closed (1995) – postulates that so-called witnesses conflated events several years apart and no victim remains — neither crash dummies nor aliens — were found in 1947. Descendants of those witnesses to the scene 71 years ago claim that their ancestors were threatened by government agents into remaining silent. Even today, after more than two decades of document requests through the Freedom of Information Act, scientists studying the incident have never been given access to classified records of that day. Some speculate that vehicle debris, removed by the military from the top-secret site, is stored underground in New Mexico’s Carlsbad Caverns. Picture thousands of fans of “Star Wars,” “Star Trek,” “Guardians of the Galaxy” and other Sci-Fi movie franchises and their families descending on Roswell to see aliens at the UFO Festival. Friday night, the festival blasts off with an outdoor film screening and concert; in 2018 it was “Independence Day” followed by Curtis Grimes. The Alien Chase 5K/10K Run or Walk launches Saturday. The fun-to-watch Alien Pet Contest follows on the courthouse lawn; see our video above. The downtown pedestrian zone is crowded with Barbecue trucks, Alien Hot Dog stands, a few craft brewery setups and snow cone vendors selling a break from the surface-of-the-sun heat. During the afternoon, people come out to the high school auditorium for the good-natured Alien People Costume Contest, to see fantasy alien costumes, cosplay (dressed as favorite other-worldly characters from the movies or TV) and self-created personas. At our visit, for example, the indescribably indomitable “Futuristic Mary Poppins” took home a top prize. A highlight, the Electric Light Parade winds through downtown after sunset, encouraging everyone to participate. Watch for illuminated silver saucers skating by and aliens chugging beer. This is the place to see some fantastic store-bought alien costumes. Another highlight for visitors, whether science nerds, Libertarians or conspiracy theorists, is three days of intensive lectures and panels done by a roster of well-known researchers and authors (plus some relatives of abductees.) Sessions are held at the town’s International UFO Museum and Research Center and are usually standing room only. There’s a genuine effort throughout the festival to engage kids with STEM topics. In addition to Alien Hat Making (reams of tin foil put to good use), there is an Alien Makeup booth where creativity peaks at painted cat whiskers. Most intriguing are several free sessions of Alien Autopsy where an educator helps kids dissect an alien organism. The biophysicist in charge revealed that specimens being poked with toothpicks and putty knives were, on earth, dill pickles stuffed with spiral pasta. Kids had a blast recording their observations in science notebooks. Very Large Array is a stunning site in the arid New Mexico desert outside Magdalena. New Mexico’s long association with rocket science and the space program round out the trip for those interested in science. Does the name Alamogordo conjure memories of the Manhattan Project, J. Robert Oppenheim’s secret program to build a nuclear bomb during World War II? Alamogordo’s Museum of Space History features a few spent spacecraft and rockets outside for selfies. Trinity Site, where the first plutonium bomb was tested later in 1945, can be seen on escorted tours, but only in April or October. Some scientists speculate that the reason the 1947 UFO was flying over Roswell was that space neighbors were attracted to Earth by radiation from the atomic blast. Much more intriguing for the family is Very Large Array, a collection of radio telescopes listening for life (and other events) in the farthest reaches of space. Run by the National Radio Astronomy Observatory, it has super computers that correlate all the data flying in from outer space to create usable research that scientists around the world can interpret. The NRAO Visitors Center presents a fascinating short film about their work, an exciting display and a fun, self-guided walking tour (plus occasional guided tours) that puts you in the midst of a field with 27 huge white dishes that comprise the VLA Telescope. Stand still and listen for a faint babbling. Can You Get a Space Fix at Spaceport America? 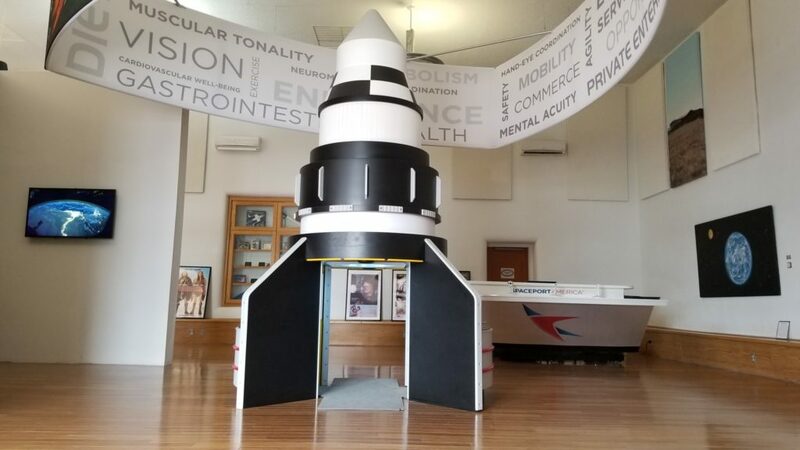 Spaceport America exhibit at the Truth or Consequences Tourist Office in New Mexico. New Mexico may have scored big in 2006 when it persuaded Sir Richard Branson and his fledgling Virgin Galactic space airline to make Sierra Country the home of Spaceport America. Due to the high-risk development of sub-orbital flight testing, however, Virgin Galactic has yet to fly civilian passengers. Although we saw advertisements for weekend tours run by Spaceport America Tours, they don’t seem to be operational. Regardless of your beliefs, Roswell is truly a bargain landing pad. The UFO Museum, open all year, has old-fashioned exhibits geared to all ages from “Star Wars” to “War of the Worlds” fans. Beyond the perimeter of the fun gift shop, kids will need guidance through the timeline of the 1947 events, period newspapers and models of the crash site. There’s hearty dining at El Toro Bravo at 102 S Main Street, with a to-go chicken grill and Mexican bakery providing extra options. Culinary standouts along the North Main Street highway include Cerritos Mexican Kitchen for lively music and fresh chilaquiles, and Classic Custards, a drive-in custard stand with both alien and familiar toppings. If you beam down to North Main Street you’ll find plenty of strip malls interspersed between small and comfortable $80 hotels and $50 motels.